The last news letter was written on the 11th of November, about three weeks after I returned from my third trip to Palestine. This is being written on my 65th birthday! Primroses and daffodils line our steep drive. The birds are celebrating in song; the blackbird's notes are as clear as the moorland air into which the music is lost. The skylarks are singing now over the moor behind us. I returned to Palestine on the 25th of February. I was accompanied by four others, including a consultant physician colleague, Dr Christopher Burns-Cox. This trip had several purposes which included Dove and Dolphin Charity business of course. We went to Wadi Foquin, in the so-called West Bank, and met with Fahmi Manasra and the chairman of the kindergarten. Fahmi had been unwell and it was plain that he was suffering from the oppression the village was under. He might feel the burden more because he acts as the spokesman, being fluent in English. There had been mounting concern because families had received sixteen notices of land confiscation from the Israel Defence Force. In addition, the same force had demanded that three newly built water cisterns be demolished. These were built with help from the EU which donates 1.2 billion euros to the Palestinian authority for a wide variety of projects. These cisterns collect storm water from the road for use in agriculture. The ability of the villagers to earn a living from the land is being threatened in these two ways. In addition,the Israeli plans to build a wall all round the village with controlled access and egress are well advanced. This is dominant in the minds of the folk. There was an undercurrent of doom. Happily the kindergarten was going well and that gives some hope. Forty-four children attend aged five and six. The building and facilities are excellent. Great care is taken with each child and careful records kept. Whilst I was filming Fahmi and the chairman, Chris was inspecting the ablutions and reported them A1. Doctors can be useful! Future Vision is the village based charity running the kindergarten. They had a deficit of over $3000 before Christmas which the D and D was pleased to clear as a gift in their darkness. We also undertook to start paying $800 per month towards the three specialist teachers' salaries which amount to $1000, the village finding the difference. Most of the folk who were in Linda Ramsden's group last October have come on board with standing orders which total about $630. The eventual tax relief should bring that up to the target of $800 per month. Later we travelled down to the Gaza 'strip' but before that we made our second visit to St John's Eye Hospital. We left a large quantity of beautiful clothes for babies and infants with Matron Jackie and Sister Ann Zawahreh. Irene Fensome from Southwold in Suffolk had made these garments. She had supported the D and D from from the start having seen me on Richard and Judy before the voyage. Irene is disabled, 76 years young and she has mothered 10 children. Well done Irene on all scores! There was a more relaxed atmosphere than previously. We were soon through Erez with our lady companion. There was only the occasional 'drone' or F16 to be heard. The people were relishing this calm and I often heard them say that they hoped the 'peace process' (hackneyed phrase) was going to build into a permanent peace. We were put up in a cheerful and airy apartment near the beach – the El-Bakry buildings- which Adli had found for us. We were able to read and eat out on the roof – the sixth storey – looking out over the blue-green Mediterranean and the fishing boats scudding in and out of the old harbour. Chris and I had a busy time. We travelled down to Khan Younis (again there was little delay at the checkpoint) and visited the European Hospital -built with European money, and then the Nasser Hospital. We were received very courteously in both and learned a good deal, especially about the difficulties facing them. The latter hospital is very much in the 'front line' and it is under stress. The former is better funded and has a more developed staff structure. I was disappointed that autopsies were rarely done there, particularly given its under/postgraduate function. However, the same criticism can be levelled at many of the hospitals here in the UK. I saw my friend Dr Khamis Elessi in the El-Wafah Rehabilitation Hospital. I filmed and interviewed a four year old boy and an eighteen year old 'sixth former' girl. Both had high paraplegias from single bullets. What further tragedies must happen before there is a just peace? I visited Khamis twice and discussed again what support there might be for a post-graduate centre which the D and D would facilitate and which myself and others would head up. The response was very positive. A floor of a new building is shortly available. I had to point out that we had little money but we probably had the will. It would mean tours of at least ten weeks. I spent a good deal of time on the charity's business. I was taken to the home of Osama Neda'a Aldahshan. This very bright 15 yr old has congenital deafness. Two other siblings out of the eight are affected too. I interviewed her with one of her older sisters signing for us. She was full of hope and wanted to learn English so she could teach it to other deaf people! She is one of twenty-one youngsters who are being helped with monthly grants of $30. These are provided by good hearted individuals, couples and groups over here who have a record and photo of the youngster being helped. The donors have made standing orders. The families of these young folk have been found to be very needy but of course there are thousands in the same boat. We hope to send little reports in this 'Dollars for Scholars' programme, with a sentence or two from the boy or girl every four months. I spent time with Abu-Ibrahim who cooked all the meals for the Hajj festival. Adli, Abu-Ali, Nihad and I also had good discussions as to the future direction of the D and D. Nihad Taha, a young graduate computer engineer, was appointed on New Years Day to work twenty hours a week for the charity and for six months in the first instance. He is proving excellent. He has initiative, good English and plenty of energy. He has suggested various useful schemes. We are deciding how best to use our limited funds this summer. We could have school bags and uniforms made in Gaza as we did in '03 and '04. 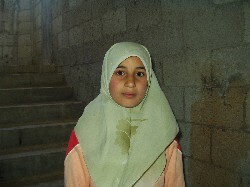 Nihad has put forward others, including the supply of water filters to kindergartens. There is the great potential of a post-graduate centre which could raise ethical/professional standards as well as morale. The latter is vital in an open prison. I was keen on employing youths to clean up parts of their neighbourhoods, including the sparse play areas. They would be kitted out with T-shirts printed up with the Dove and Dolphin logo and the charity's name in Arabic. Nihad has already put the scheme on the starting blocks by talking to council officers! They would earn some precious shekels, do some good work and raise spirits. At present, our balance will not stretch to this. I asked Nihad 'how are things in Gaza?' He says very difficult, without any ease in the poverty and social problems. And that is not all he says. In considering the much vaunted Road Map and Gaza alone, I am disturbed that there are no reports of any discussion about building a seaport after Israeli withdrawal from Gaza. Some Palestinians seem to meekly accept that the Israeli state would not accept this. However, without this the breadwinners in this population will not be able to earn a living. Unemployment will stay at between 50% and 70% and dependency almost complete. Charity is not the answer but justice is. Until that comes to this remarkable and resilient people - we help. d. all donations I make from the date of this declaration until I notify you otherwise as Gift Aid donations (*please delete as appropriate). I understand that I must pay an amount of income tax or capital gains tax at least equal to the tax the charity reclaims on my donations in the tax year.